From April 9 to April 22 the 12 national political parties and three local parties eligible to contest the 2014 general elections are submitting their preliminary lists of candidates for the national and local legislative bodies to the General Elections Commission (KPU). The following is a glimpse of the recruitment process that involves the search for more than 240,000 candidates for over 20,000 seats. Based on interviews in Jakarta, The Jakarta Post’s Prodita Sabarini and Sebastian Partogi filed the following report. In January, the Great Indonesia Movement Party (Gerindra) made an unprecedented move in the country’s politics: advertising in the national media to call for applications to run as legislative candidates with the party in next year’s election. A number of other parties followed suit. The Democratic Party (PD) also made a public call with posters and banners as well as an announcement on their website with the tagline “The People Call for the Nation’s Best Sons and Daughters”. Gerindra succeeded in attracting thousands of applicants, but it also raised skepticism of the effectiveness of such methods in netting qualified candidates. The legislative election is one year from now and the General Election Commission (KPU) opens submissions for parties’ candidate lists starting from today until April 22. Ahead of the presidential election, the legislative race in April 2014 will contest over 20,000 seats for the House of Representatives and provincial, municipal and regental legislative councils (DPRD). Over the past weeks the 12 national political parties and three local parties in Aceh province have been scrambling to prepare their shortlists. If all parties manage to get candidates for all available seats, there will be more than 240,000 candidates contesting the legislative elections. Gerindra’s deputy chairman Fadli Zon said recently that nearly 3,000 people applied to run for House seats with the party. More than half of the applicants were new recruits from outside Gerindra, he said. But this also included those from parties that could not join the election, due to an increase of the electoral threshold to 3.5 percent of national votes. In the last polls, 34 parties joined the race. Similarly, more than half of Gerindra’s 600-plus applicants for the Jakarta council were new recruits, according to Syarif, the head of Gerindra’s Jakarta chapter for its cadre division. The Prosperous Justice Party (PKS) says it does not conduct recruitment that is open to the public. Its spokesperson Mardani Ali Sera said such methods would make the recruitment process seem like a regular job application. Similarly, a blogger in the citizen forum Kompasiana.com suggested anyone unemployed could apply to be a legislator. Hopes are high that next year’s election will bring better legislators compared to the previous batch in the parliament and local legislative councils. The Corruption Eradication Commission (KPK) has urged parties to select better candidates, as legislators that were arrested and tried in court have been found guilty. The recruitment and selection process differs from one party to the other. Parties that select candidates from within their political machine have started their preparation earlier than parties that recruit from the outside. The former tend to select candidates based on their track record in the party’s activities. The Golkar party started preparations from February last year by holding functionaries’ orientation programs. “We don’t enlist candidates out of nowhere,” said Binny Buchori, head of Golkar’s Center for Membership Development and Leadership Training. “We have a rule that only cadres that have been in the party for five years and have gone through the functionaries’ orientation can run for legislative candidacy,” said Binny. Incumbent legislators are also obliged to participate in the program if they want to reenter the race. Up to now, Binny said, around 2,500 cadres have graduated from the program. She said that more than 560 people are on the long list of candidates for the House. Party leaders will select the names for the short list, based on their dedication to the party and their electability. Most of the incumbent legislators are running again. Binny, who failed to win a seat in the 2009 election, is among the prospective candidates. PKS and the Indonesian Democratic Party of Struggle (PDI-P) started their preparations last November. PDI-P recruited prospective candidates from within the party from last November to late January. Its selection process started in February this year and included psychological tests, interviews, written tests and drug tests. According to Idham Samawi, the PDI-P’s head of cadre recruitment and selection, party chairwoman Megawati Soekarnoputri had suggested the use of psychology tests in late 2011. “Ibu Mega was concerned over problems involving party members. Those who jumped ship to other parties, those implicated in criminal misconduct and those who bickered with fellow party members […] She decided that we needed to capture the psychological profile of party members,” Idham said. He added that the test was also to determine candidates’ interest and capability. Idham said that ideology was an important part in the selection process of PDI-P, known to be staunchly nationalist. He cited that if a prospective candidate appeared to have an agenda or a mindset about changing Indonesia into an Islamic country, the latter would not pass selection. The PKS West Jakarta branch secretary, Agung Setiarso, said that in November the party started to announce in mosque gatherings that party cadres should recommend names to be listed for candidacy. He said that PKS’ selection process comes from the bottom up. The West Jakarta branch fielded more than 30 names to recommend to the party’s Jakarta branch for the local councils and House seats. PKS spokesperson Mardani said that they rank the candidates based on recommendations from each party level. A recommendation from an individual party cadre is worth one point; that of the party branch in the neighborhood unit is worth 10 points. The score multiplies by 10 up to the party’s national headquarters, where the recommendation is worth 10,000 points. “You can’t really apply to be a candidate, you have to be chosen by others,” Agung said. However a female prospective candidate for the PKS said that she approached the party leaders in Lampung province, expressing her interest in running in the election, and became short-listed. 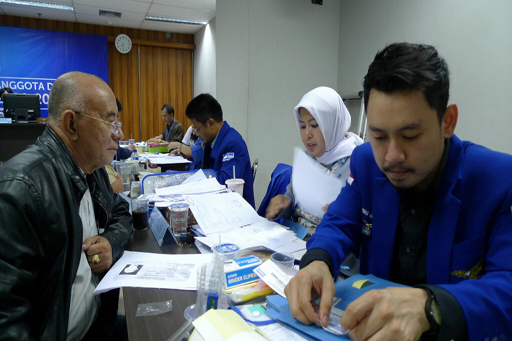 So far PKS has fielded 15,462 prospective candidates for the parliament and local councils. “We’re not forcing ourselves” to have candidates for all seats if applicants were not qualified enough, Mardani said. He added that 20 percent of their prospective candidates were from outside of the parties. Parties that recruit from the general public started their recruitment and selection process this year. Gerindra started to publish its ads in the media late January and opened the application period for the whole of February. Meanwhile, the Democratic Party made its public announcement in March, and opened the application process from March 6 to 31. Officials of the Democratic Party’s recruitment division said that up to Monday some 1,070 applicants had applied to run for parliament seats. Some 30 percent of the applicants were new recruits. The ruling party that has been plagued with graft scandals weighs the applicants based on their resume. Nurita Sinaga of the party’s recruitment section said applicants did not have to go through an interview or written tests. “We rank them based on their resume, because from there we can judge their level of activity and networks,” she said. The ranked list would then be submitted to the Democrat’s Supreme Assembly for selection. Gerindra required applicants interested to run for national parliament seats to include videos of them meeting with the community. The video shows whether the public is familiar with the applicant and whether the applicant can gather a crowd, Gerindra Jakarta branch secretary Syarif said. Meanwhile, for applicants interested to run for local councils Gerindra required them to submit 1,500 copies of IDs, as proof that people in their respective electoral basis know them. For the next step, Gerindra’s selection committee hires university students to verify the applicants’ diplomas and their local popularity. “You know there are a lot of fake diplomas out there, so the students go to the applicants’ university and ask whether they really graduated from those institutions,” Syarif said. A student helping Gerindra, Lukman B Permana, said that some residents gave poor comments about applicants. “A lady said ‘Oh that guy, yeah, I know he’s running. He’s not active in the community.’ She seemed to dislike him a lot,” Lukman said, adding that the findings were submitted to the selection committee. The last step for Gerindra was the interview. No less than the party leaders and founders — brothers Prabowo Subianto and Hashim Djojohadikusumo — were among the interviewers. “The interview for DPR candidates lasted for hours. The applicants came out red faced, some saying they regretted applying to Gerindra,” Syarif said. Fadli said applicants to Gerindra included former authorities, celebrities and athletes. “There are also former bureaucrats, former soldiers and professors,” he said. The race for legislative seats is set to be more competitive than at the last election. Parties are looking for votes from a society that is increasingly disenchanted by the poor performance of lawmakers. Voter turnout has been dwindling from 93.3 percent in 1999, just after the fall of president Soeharto, to 84.9 percent in 2004 and 70.9 percent in 2009. The Indonesian Survey Institute (LSI) predicts that next year’s election will only see 60 percent of voters turn out. Even Lukman, who traveled to corners of Jakarta to help Gerindra’s verification process, said that he would abstain from voting.